The Golem of Gabirol, by Olga Volozova. 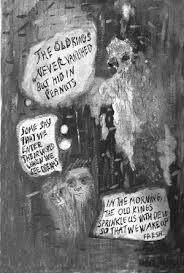 This comic was one of the first published by Sparkplug after the death of Dylan Williams, and the discovery of a talent like Olga Volozova's is a testament to Williams' eye for comics that are unusual, intensely personal and poetic. Her The Golem of Gabirol is based on "the legends around the name of the Hebrew poet, scholar, Kabbalist Solomon Ibn Gabirol, who lived in Moorish Spain in the 11th century C.E.". It's a powerful story about a young woman sent to stay with her uncle, and the unusual Reb Solomon that she meets. It's a story about the intersection between words and reality done in what I call the "immersive" style of comics, wherein text merges with image for both decorative and narrative purposes and there's almost no negative space on the page. In a story where Solomon creates a "golem" version of the protagonist, Zuleicha, that intersection becomes all the more powerful, because golems are created out of clay and brought to life thanks to words that are written on their foreheads. 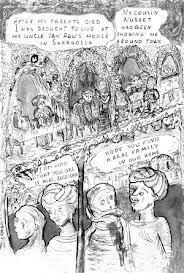 Volozova digs deep into folklore to tell a story about the love triangle between Zuleicha, the facially disfigured Reb Solomon, and Zuleicha's cousin Nusret, who falls in love with her and marries her. There's a magnificent page early in the book where a speech by Solomon that claims that "letters are the elements that God created the world with" makes up the tree that she and Solomon happen to be sitting under. It's a transformative moment for her, because it makes her lose her fear of death while simultaneously imparting her with a thirst to understand poetry as the building block of creation. Solomon creates the golem (with Zuleicha's features) when Zuleicha gets married, which leads to him fleeing for suspicion of using dark magic. From there, the book becomes a journey for Zuleicha, who can see the fabled "old kings" of the earth who preceded Adam. 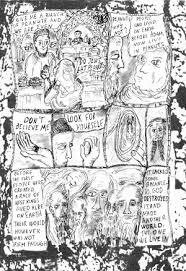 In Volozova's immersive style, the spirit world and its manifestations (including the old kings) appear where negative space might appear in another comic. Like Zuleicha, the reader is allowed to see what is unseen by others, a disorienting technique that takes some getting used to. Indeed, most immersive books fairly demand that the reader approach them on the book's own terms or not at all. Tragedy strikes in the end, as Zuleicha loses both Solomon and her jealous husband. She manages to go unscathed in a sense, even after she has obtained forbidden knowledge and awareness of history and how the world truly is. She is left with the question of why Solomon eventually chose to break his golem and wonders whom he loved more--her or the golem? As to the latter, she's asked a question in return: whom did Adam love more, Eve or Lilith (who was cast out of paradise)? As to the former, she understands that "why" is the wrong question to ask. She believes he would have said "We are all made of words and need to have our stories told"; in essence, every human being is their own sentient story. In the case of his golem, she was in danger of being possessed by the ruler of the city instead of having any kind of free will of her own, of having any ability to tell her own story. In a sense, she was a cautionary version of Zuleicha herself, who as a woman had little in the way of rights or freedoms. That she wound up relatively free was largely due to her own strong sense of her personal narrative while managing to evade being overly molded and shaped by external architects. For Volozova herself (who dedicated the book to her late husband, who was also a rabbi), The Golem of Gabirol represents her own attempt to create life using text., in order to honor an old legend, to establish a memorial for her husband and to construct a feminist narrative where she builds a creative space for herself and Zuleicha, word by word.